Dubba's Note: The following article was provided by Wall’s Refrigeration Solutions. I don't usually do this kind of thing, but my geeky/technical side loves the design. We all love ice cream from chocolate, fruit, nut or caramel we each have our own favorite flavors. I’m sure given the choice we would all find it hard to turn down buying ice cream when we pass it in the store, but a large amount of effort and thought goes in to making you feel this “impulse” to buy ice cream. This is not a cruel trick to try and control you it’s just our human behavior to be subtly swayed in our buying decisions. The 2012 shopper engagement study found that 55% of us are prone to making unplanned purchase decisions. It is not only ice cream manufacturers trying to be the 55% of every shopper’s unplanned purchase; most of the products in a store are trying to achieve this. The same study found that 76% of shoppers base their buying choices on attractive packaging and appearance. The location of the product also plays an important factor, often the “impulse” or snack ice cream that we see in stores in not located in the freezer section next to frozen peas and fries. Instead it is located at the end of an isle in close proximity to the checkouts, this so that our attention is drawn towards it and in the case of snack ice cream can be purchased and eaten straight away. The design of the freezers that display ice cream has developed since the continuous-process freezer was perfected in 1926. Ice cream freezers were originally designed to keep the products frozen and allow easy access for customers. To the right is an example of a modern but more basic freezer which serves this purpose very well but does little to really sell the product to the customer. 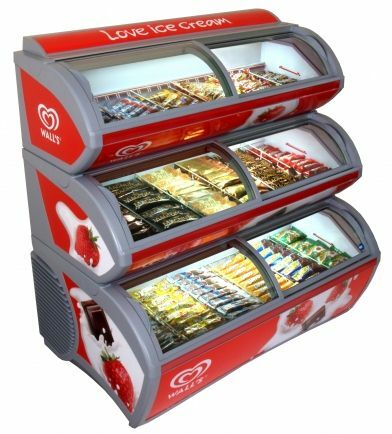 Ice cream packaging has been designed to be bright, colorful and to stand out, so the freezer display unit plays a large part in helping to show off the product and entice customers to buy the ice cream. First of all it is a bright red color that is designed to stand out at the end of an aisle. The graphics include strawberries and chocolate splashing in to cream; this is meant to give the customer the immediate association with ice cream after noticing the bright red freezer. At the top of the freezer you may notice the phrase that I used in the opening sentence of this article “love ice cream” this is meant to stir a positive emotional response towards ice cream. This ice cream freezer holds around 3 times the volume of the freezer above yet its 3 tier design means that it doesn't have to take up 3 times the amount of floor space. This allows for there to be a larger variety of ice cream on display. In addition to this the freezer is also around 45 cm taller than the freezer above which brings the ice cream further in to the eye level of the customer, it is well documented that products that are in the eye line of the customer sell better. The multi height 3 tier design also allows children’s ice cream to be placed on the lower tier where it is much more viable and accessible to children. Lastly you may notice the ice cream packaging in the freezer above appears particularly bright and colorful this is because it has been well lit with strips of LEDs. Without lighting the ice cream packaging would not stand out at all in the dim freezer, but the lighting level is actually brighter than it needs to be which helps it stand out in the store; however this is not a waste of electricity as the LEDs are very efficient. I’m sure after reading this you will look at an ice cream freezer a little differently and appreciate the years of research that have gone in to its design and placement to persuade you to make a purchase, however on the other hand you could just enjoy your favorite ice cream. This article was written by Stuart Grimshaw, Marketing Manager at Wall’s Refrigeration Solutions. One of the UKs largest suppliers of refrigeration products and a Unilever owned company.